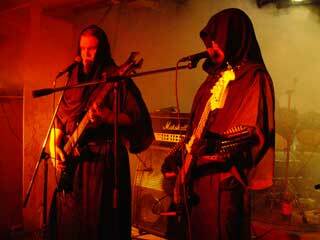 Wormphlegm are a duo from Finland who play a special kind of Funeral Doom mixed with Black Metal elements. Their music has been described as slow, monotonic, featuring crushing guitar work and ritualistic, almost trancelike, drumming. It also features occasional serene, near-melodic guitar parts. The Band Members are Maggotworm Incinerator Abscess (Drums, Vocals) and Grubgorge Pestilent Diarrhoeator (Guitars, Bass, Vocals) They released a demo in 2001 entitled "In An Excruciating Way Infested With Vermin And Violated By Executioners Who Practise Incendiarism And Desanctifying The Pious" which includes one song that lasts for 32mins 07secs and a full length album in 2006 called "Tomb Of The Ancient King" containing three songs called 1.Epejumalat Monet Tesse Muinen Palveltin Caucan Ja Lesse, 2.Tomb of the Ancient King, 3.Return of the Ice Age and the Tortyrant.